A great gift for you or a friend! Give the gift of Zara with the convenient, gift card. 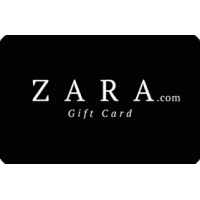 Valid for all Zara stores in Canada and at Zara.com for this country, these gift cards come preloaded, and can be reloaded in store and online. For full terms and conditions of the gift card, please visit https://www.zara.com/ca/en/z-shopping-guide-l1403.html?fts=8. Zara, the Zara logo and the Zara Card design are either trademarks or registered trademarks of Zara. Zara is not a participating partner or sponsor in this offer. No expiration date. Your online gift card will be sent by email. Redeem the Zara card in-store by displaying on your mobile phone. Copyright © 2019 PlanetRate Inc.	A Canadian company, proudly made in Montréal, Québec.